Searching for Eddie Running Wolf is the directorial debut for Thomas Hartmann in the feature length documentary category. Thomas began the journey of making this film nearly a decade ago when he wrote a proposal for a documentary that would examine the personal life and career of one of his artistic inspirators, Eddie Running Wolf. 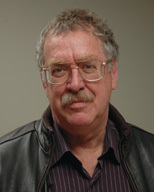 Thomas served as director, producer, cinematographer and editor on this film that spans decades of drama, laughter, friendship and loss. He previously served as producer, editor and composer for the award winning Iraq War documentary, The Triangle of Death, winner of the Founder's Choice Award at the 2009 GI Film Festival in Washington D.C. This particular film has aired on the Military Channel and the Pentagon Channel. Thomas is the owner and creative director of Blink of an Eye Productions which has been producing music videos, documentaries and commercials for various corporate clients across the country. He has also built Blink of an Eye Productions into a successful wedding documentary business that has been serving brides throughout Chicago-land and around the globe, traveling to such locations as Cabo San Lucas, Napa Valley, New York City, Oaxaca, Mexico and Sydney, Australia. Thomas currently resides in Naperville, Illinois with his wife and three children. Eddie Running Wolf is a talented artist and wood carver who has been creating and selling his awe inspiring works of art since the early 1980’s when he exhibited them as a featured artist for a gallery in Aspen, Colorado. 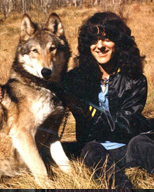 Eddie became somewhat of a local celebrity in Aspen as he was often seen with his 125-pound Tundra wolf that he kept as his pet and companion. Eddie’s dramatic woodcarvings earned him financial reward and critical praise over the years, as many of the rich and famous that lived in Aspen purchased these delicately carved creations. His career and personal life are examined in the documentary, Searching for Eddie Running Wolf, as he attempts to chisel his artistic masterpiece from an enormous block of white marble. The drama that ensues comprises the core of the documentary. Eddie opened the doors of his home to allow the filmmakers access into his life, and for that we are eternally grateful. Dr. Joseph Hartmann is one of the principal cast members in the decades spanning documentary, Searching for Eddie Running Wolf. Dr. Hartmann has worked as a practicing cardiologist for the past 35 years in the western suburbs of Chicago. He is an avid art collector, and it was his love for Eddie Running Wolf’s creative work that brought this entire story into realization. Sixteen years ago, Dr. Hartmann commissioned Eddie to carve the white marble statue that stands at the heart of this dramatic and entertaining film. He patiently awaits the arrival of Eddie’s marble masterpiece. 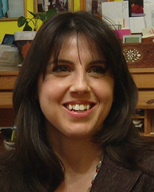 Melissa Wolf is the wife of Eddie Running Wolf and the mother of their two adolescent sons. Melissa has been by Eddie’s side as a companion and lover since the early 1990’s. Melissa becomes an integral part of the documentary, sending the film into an unintended and bizarre trajectory. 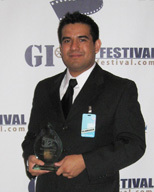 Juan Montelongo served as a producer and cinematographer on the film, Searching for Eddie Running Wolf. He has proven himself a valuable asset to the Blink of an Eye Production team, helping to produce numerous commercials and documentaries over the past ten years. 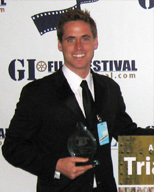 Juan previously served as a Producer on the feature length documentary, The Triangle of Death. The film was viewed at over 30 film festivals across the country and has won a variety of awards including The Founder’s Choice Award at the GI Film Festival in 2009. Juan currently free-lances his filmmaking skills throughout the Chicago-land area, working for various film production companies. 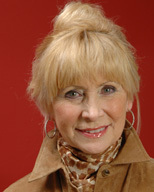 Sharon Hartmann served as Executive Producer on the film, Searching for Eddie Running Wolf. Her behind the scenes efforts to not only help support this project but to execute and organize all the necessary production tasks were invaluable to the production of this film. Sharon has also been a successful real-estate investor in Naperville, Illinois for the past thirty-five years.